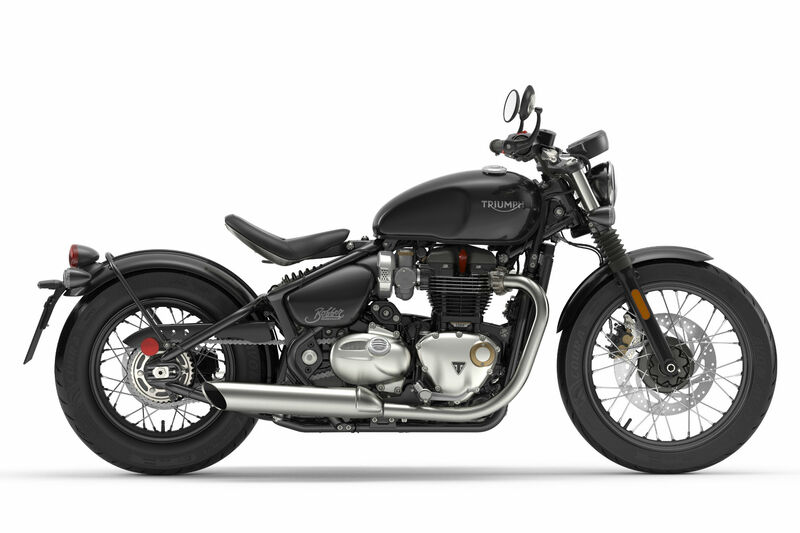 SIGHT alone of the Triumph Bonneville Bobber has been enough to persuade over 450 people to put down a cash deposit, with specs and full price yet to be confirmed. I don’t think they’ll be disappointed when they take delivery of their new bike in February. The Bobber makes 77hp and 78lbft, and starts from £10,500 in black. ‘Why so little power?’ someone asked when we revealed the figures on our Facebook page. 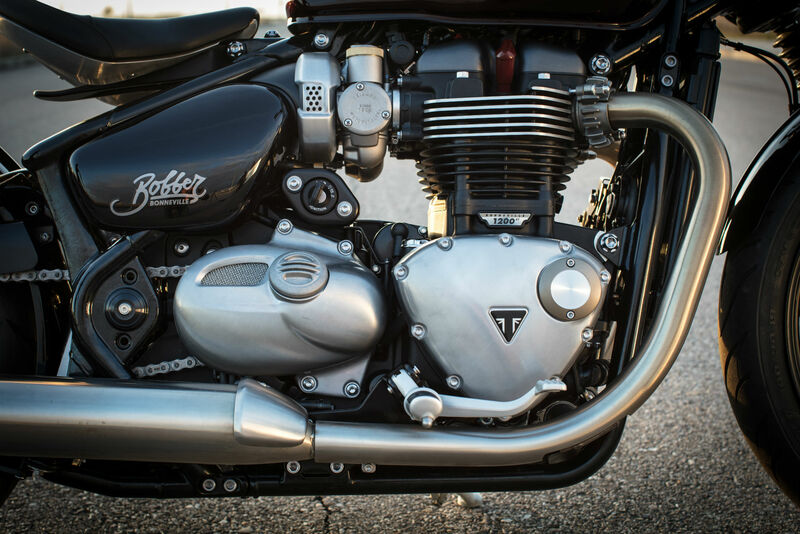 There’s a clue on the side of the engine, which is the 1200cc version of the new liquid-cooled Bonneville plant, as opposed to the 900cc one found in the Street Twin. It says ‘HT’, which stands for ‘high torque’. That indicates it’s not the ‘high power’ variant of the same 1200cc motor, which makes 97hp in the Thruxton R, but closer to the 80hp one in the T120 Bonneville. Slightly less powerful, in fact – a detail I was surprised to learn when Triumph told us the specs at the end of the launch ride in Madrid. Despite the figures, the Bobber feels more akin to the Thruxton R than the laid-back T120, which puts you in a good mood but doesn’t compel you to ride fast. I’d convinced myself during the ride that the Bobber’s engine was stronger than the T120’s. While it does make slightly more torque, at 78lbft instead of 77lbft, I think the real key to that impression – and the big surprise about the machine – is its handling. More to the point, its good handling. It’s not a long-wheel-based lump that won’t go around corners, which is the tempting preconception. It loves bends. It felt agile, or more so than its appearance and style suggests it ought to be. Claimed weight is 228kg dry, 4kg more than the T120, but it feels lighter, possibly because of a lower centre-of-gravity. If it sounds heavy, Triumph’s defence is that it’s a ‘solid metal bike’. 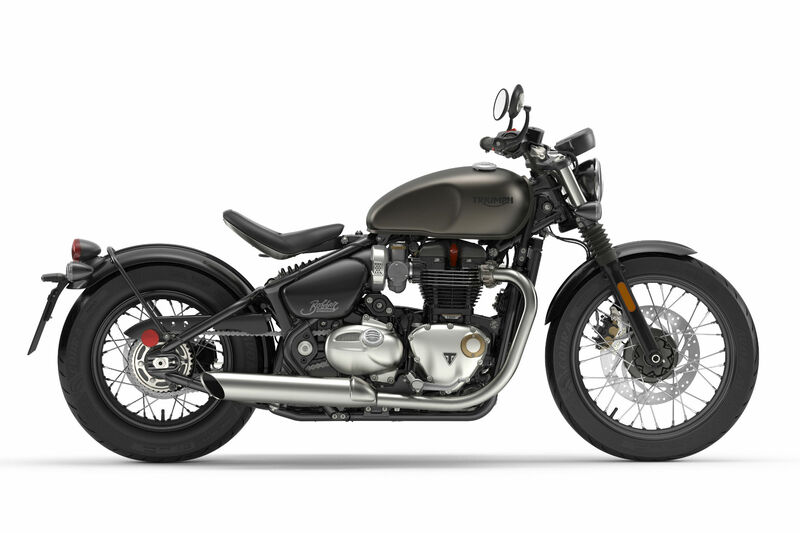 Triumph says the fact the Bobber is designed without consideration for a pillion has allowed the suspension travel to be shorter, probably one of the factors making it feel taught. There’s 77mm of travel in the shock and 90mm in the fork. Lift your weight off the seat and you can feel the shock reaching full extension with a slight jolt. Ground clearance is enough to have fun, without worrying on every approach to a corner. Mostly I was expecting the pegs to go down but they didn’t. The hero blobs are short, so that when they did ground I sometimes found the heel or sole of my boot did too. The ride included damp roads, with a foggy start and temperatures as low as 2C before the sun came out. The tyres, Avon Cobras on a 16-inch wire-spoked rear wheel and 19-inch front, offered good grip throughout. 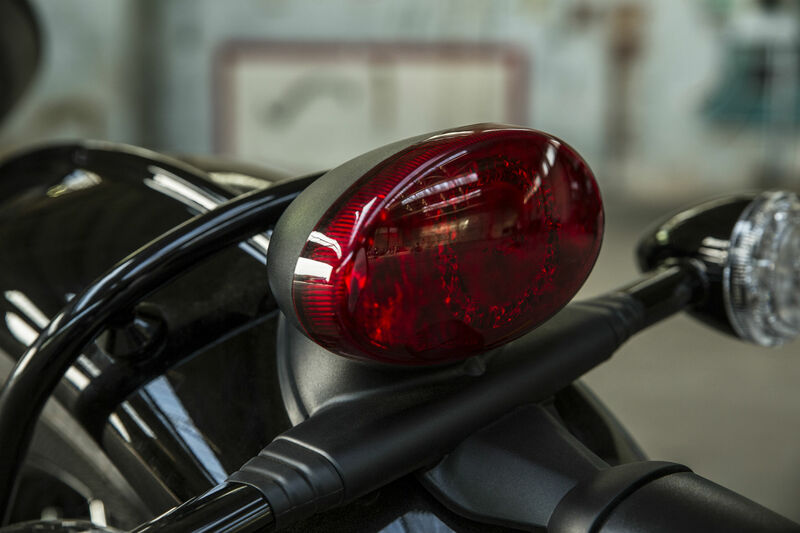 They’ve been developed for the Bobber according to Triumph. And of course, what you get with the high torque variant of the engine is the torque-bias it suggests. More pounds-feet than horsepower, in fact. 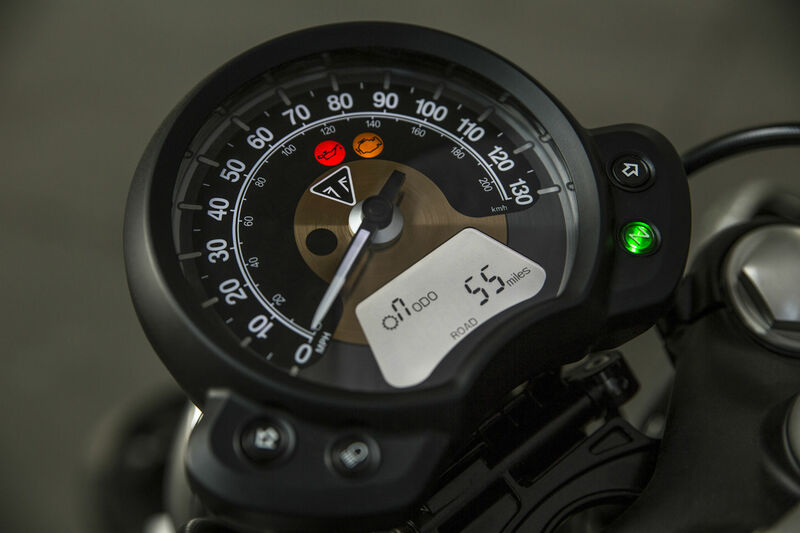 The engine hits a rev limiter at 7,000rpm – and a digital rev-counter is among the information that can be shown on the digital display in the analogue speedometer, along with gear position, time, current and average fuel consumption, fuel level and range. There’s no imperative to find that limit, or go much above 6,000rpm, because the engine is most satisfying between 3,000 and 5,000, propelling the bike from corner to corner in meaty bursts of acceleration, with a surprisingly loud burble from the pea-shooter-style exhausts. Sometimes, on Harleys, I’ve felt like the riding position has made me into the least aerodynamic shape possible, like a human cup, the wind forcing my knees apart at speed. We spent some time at high motorway speeds on the Bobber and it created none of those sensations. My eyes were streaming from the wind finding its way up the visor of my open-face helmet. That was the only discomfort. The Bobber is in fact very comfortable. I’d wondered beforehand whether the riding position would be extreme, not being particularly accustomed to feet-forward machines. It’s not. It’s quite natural, with your feet out in front of you just a bit, as they might be if you were sitting on a low chair. The seat is very firm but, because it's bum-shaped, comfy for hours. Eventually it began to feel a bit unyielding but only toward the very end of the ride, which was about 150 miles. I also got the occasional cramp in a leg, something I sometimes suffer from on bikes with a short distance between seat and pegs, which can only be relieved by standing up. 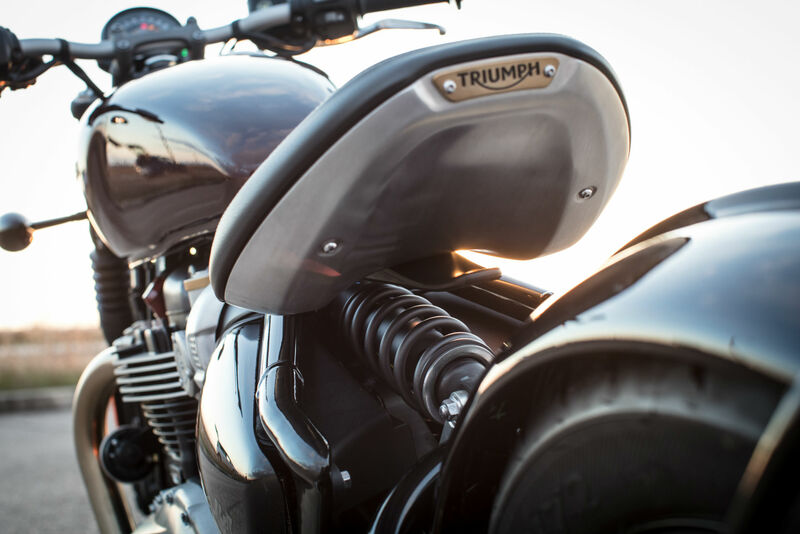 The seat also acts as a good bum-stop under acceleration and, in what Triumph says is a first in the bike’s class, can be moved backward or forward a few centimetres, creating an adjustable riding position. 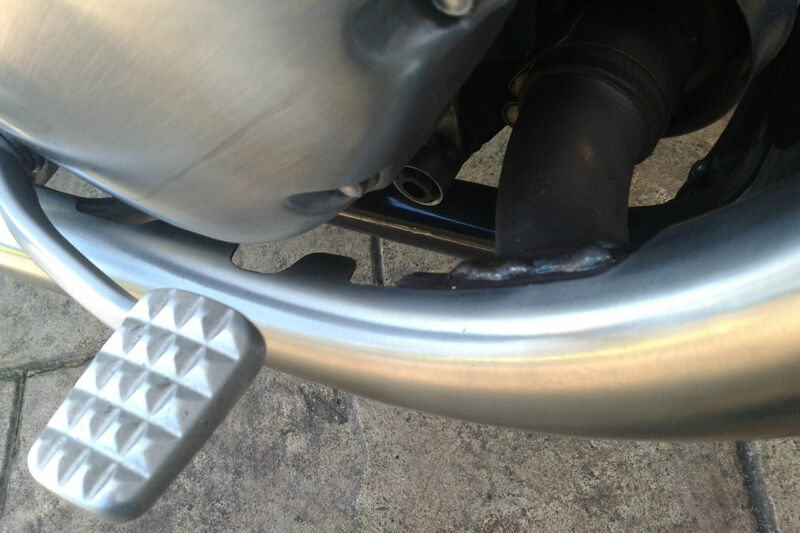 A bolt is loosened to tilt the seat upward, giving accesses to another, beneath the aluminium seat pan, which is loosened to move it backward before dropping it back into position and retightening. The clock is also adjustable, tilting forward or backward after you’ve undone a quick-release catch on the back. After riding in the morning with the seat in its forward-most position, I switched to the rearmost for the afternoon. It still didn’t feel extreme. I was comfortable and able to do a U-turn without over-stretching to reach one of the bars, but it felt a bit more like a Bobber probably should, laid-back, belying the bike’s handling. I quickly stopped noticing any difference because in either positon the Bobber makes a very engaging ride. I think I’d expected it to be primarily a styling exercise, with performance secondary. Made for a cheerful, leisurely Sunday afternoon jaunt (like the T120). But it’s much more about riding as fast you can (like the Thruxton R). It’s a styling exercise ­­­too though. Probably the most striking element is that seat and the aluminium seat-pan underneath, with the Triumph logo on the back. The notion of it being a truly authentic-looking Bobber fades under close scrutiny. But this is a 2017 production motorcycle, made to meet construction and use regulations, have rear suspension and not blow-up – not a one-off custom. Triumph’s gone to some trouble to hide things which give the game awa. The rear brake master cylinder is behind what looks like an aluminium engine case. Undo what looks like it might be an oil filler cap and instead you see the brake fluid level. 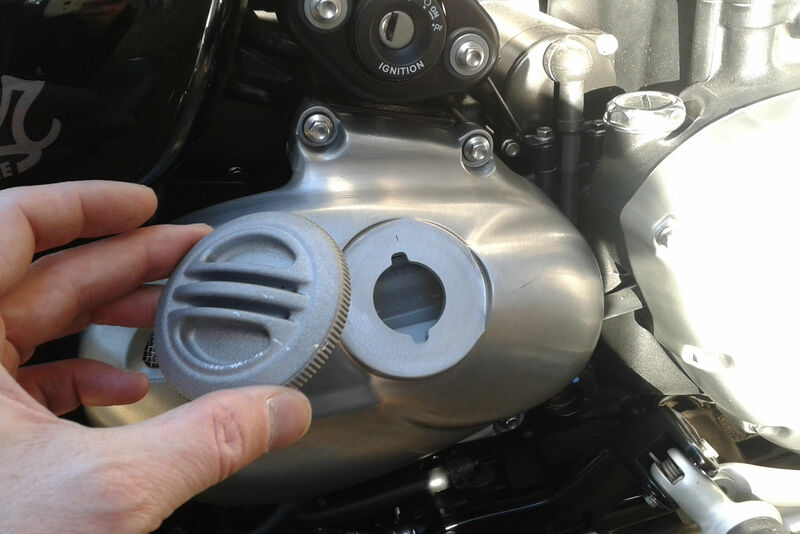 The battery is hidden by what Triumph calls an ‘authentic battery box’. A plastic cover can’t really be called that authentic but it doesn’t look bad. See pictures below. The ignition is on the right-hand-side, below the fuel-injector bodies, which look like carbs. The steering lock is on the headstock. The ‘cage-style’ swing-arm matches the lines of the all-new frame, for a hard-tail look, although the conspicuous shock under the seat obviously blows the game. That brushed stainless steel pea-shooter exhaust isn’t a pea-shooter at all. A pipe leaves it, enters the catalytic converter hidden under the engine and then returns further down, so that a section of exhaust you can see carries no gasses at all. It’s not even a real exhaust – it’s just an outer cover that looks like one. The real pipe is behind it. It’s a convincing job at a glance. The tank is smaller than the T120's, at 9.1 litres, so more sympathetic to the Bobber cause. Of course that has practical implications. Triumph claims 69mpg in ‘test conditions’, giving a 138 mile range. Under the conditions of the launch ride, the bikes did 75 miles before the fuel gauge read empty, while the average-fuel-consumption metre said 41.6mpg. But you can’t have a Bobber without a small tank. A styling detail that looked out of place to my eye was the plastic rear LED tail light housing. 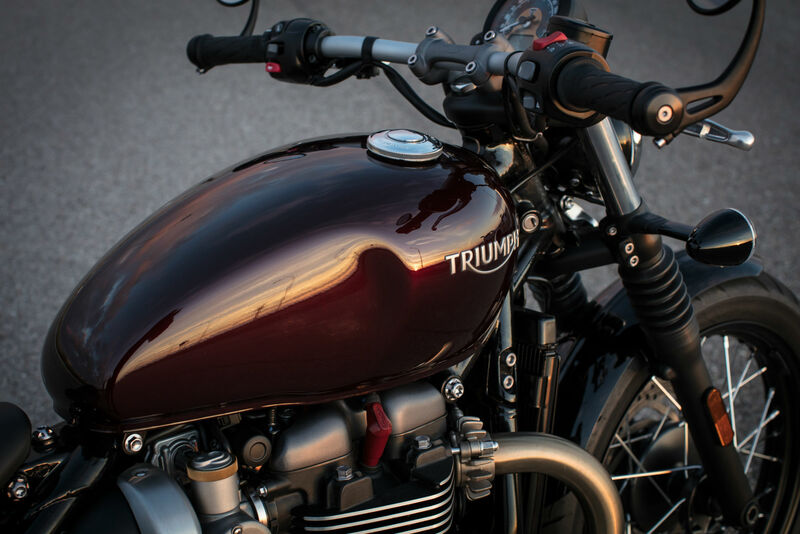 Overall, though, the Bobber is a very nice thing to look at, which will be why hundreds have sold already. 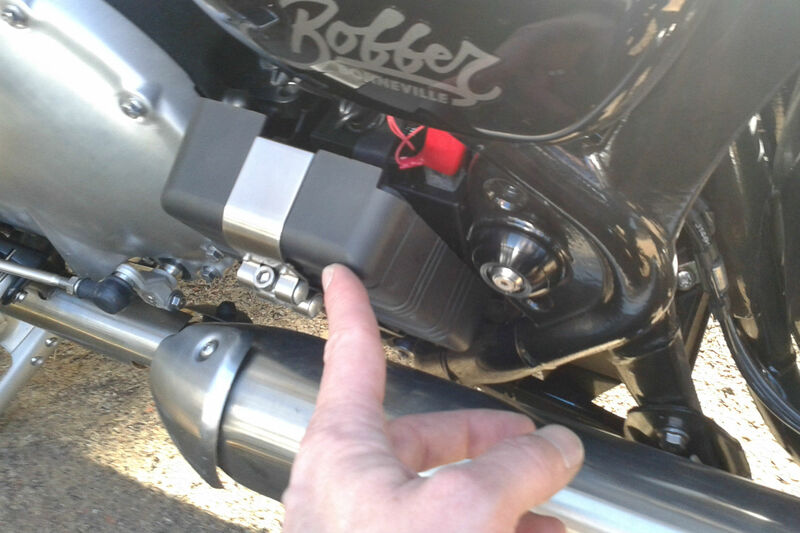 One area in which Triumph definitely hasn’t tried to replicate an authentic Bobber is in rider aids. 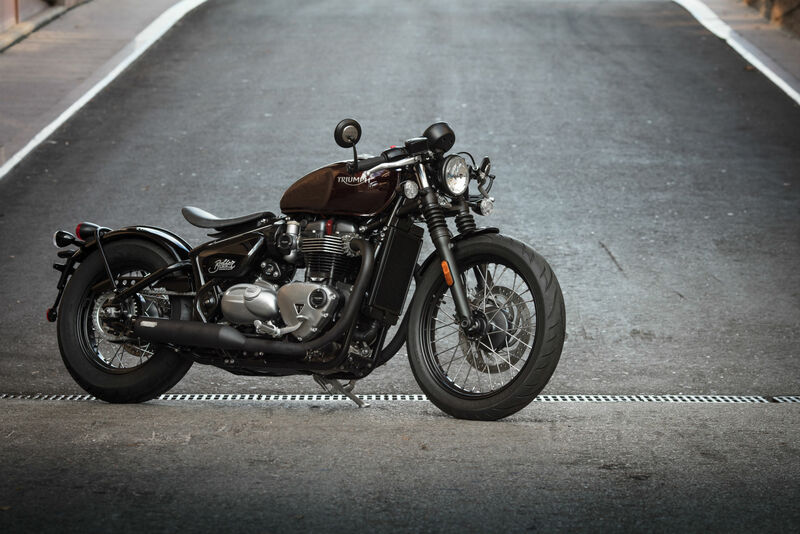 Like other models in the new Bonnie range, this Bobber has ABS, switchable traction control and a ride-by-wire throttle with two riding modes, ‘Road’ and ‘Rain’, offering a different throttle response. It's also got an assist clutch to make the lever lighter and engine immobiliser with a transponder ignition key. The test bikes had heated grips, which are an option, as is cruise control. At times I wanted more power from the front brake, which is a twin-pot sliding caliper on a single disc. It never caused me that much worry but it’s one of those set-ups that can have me wishing I’d applied the lever with my two fingers further out along it, for more leverage. By the time that thought occurs, it’s too late and you just have to squeeze harder, which probably isn’t conducive to precision. 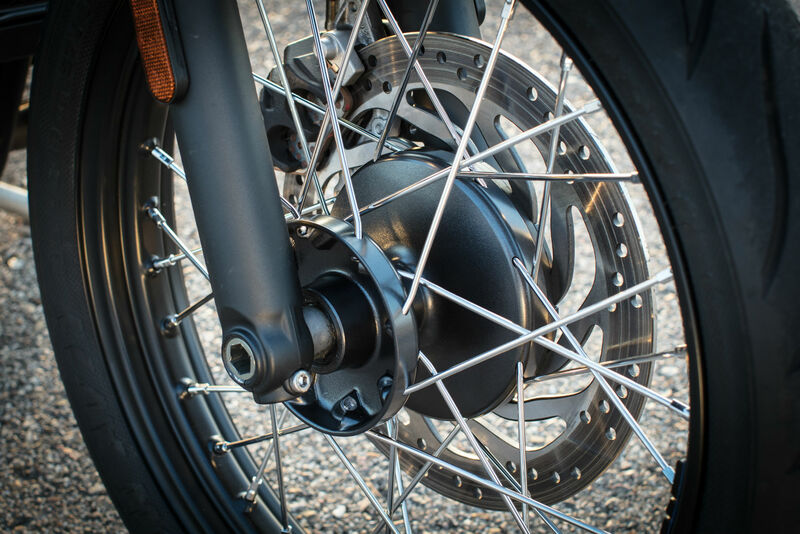 I can understand why Triumph has given it a single disc, since Bobbers are supposed to be minimalist, not cluttered with sports bike-style brakes. I think it could probably have been given a four-piston caliper without spoiling the look, though. If I’ve got another doubt about the Bobber, it’s the question of whether it should have been given the 97hp high-power version of the engine which, after all, also makes more torque, at 82.6lbft. Bobbers are supposed to be in a high state of tune as well as stripped down, aren’t they? But no. The Bonneville Bobber works too well as it is for Triumph to be given anything but the benefit of the doubt on that decision. The engine isn’t quite the same as the T120’s. It’s got a new twin air-box with two filters, and makes 10% more power and torque at 4,500rpm, Triumph says. As I've said, I would have sworn it was stronger. In fact I did say so, in my on-camera review after the ride, before we were told the specs. If you’re one of those to have already ordered one, I think you’ll love it when deliveries begin in February next year. If you want one but haven’t ordered yet, you may have to wait a little longer for more to arrive from Thailand, where they are manufactured. It’s ‘made to customise’ (like almost every other bike these days, it seems) and so there is a range of 150 ‘custom’ accessories, including seats, bars and exhausts. 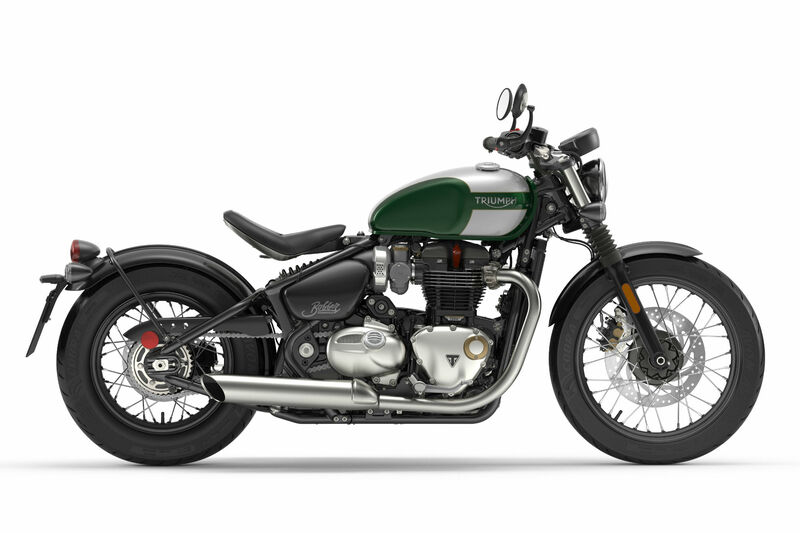 As with other members of the Bonneville range, Triumph is also offering ‘inspiration kits’, which are packages of accessories for a particular look. One is the ‘Old-School Bobber’, including ape-hanger bars, a swing-arm bag and thinner, steel seat pan, for an extra £1,610 plus fitting. 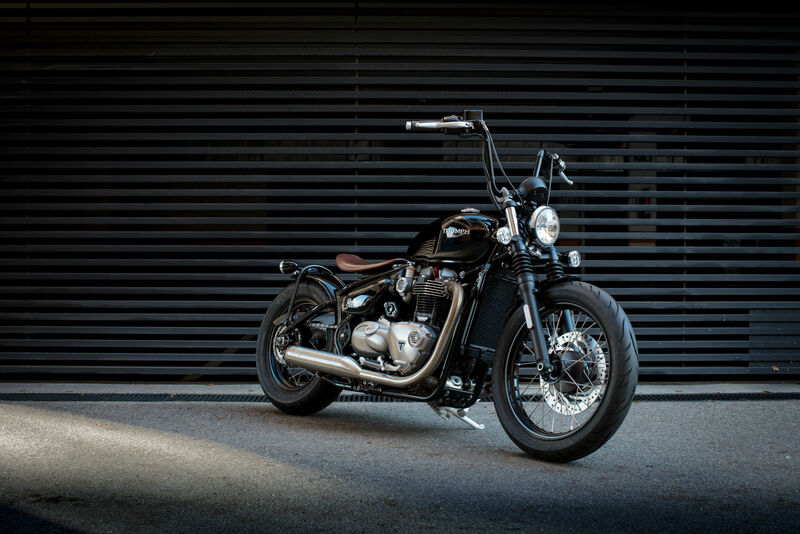 The other is the ‘Quarter-Mile Bobber’ including clip-ons, a black Vance & Hines exhaust and shorter front mudguard, for £1,500 plus fitting. Measured according to regulation 168/2013/EC. Derived from specific test conditions for comparative purposes only. May not reflect real driving results. The Bonneville Bobber in Ironstone grey, as ridden. Pea-shooter exhaust isn't as it seems. Battery cover isn't so authentic but looks okay. Rear brake master cylinder is cunningly hidden.